Some reports indicate that the Alibaba IPO date could be scheduled for the first week in August, but no official date has been set. One thing is for certain, however: When Alibaba hits the market sometime in late 2014, there will be a lot of people who pocket a lot of profit. Those following the deal have learned about the huge windfall Yahoo Inc. (Nasdaq: YHOO) is expecting through the Alibaba IPO. Yahoo owns a 24% stake in Alibaba and is expected to sell up to 50% of that stake through the initial public offering. Considering some estimates place Alibaba's value over $150 billion, Yahoo could walk away with an extra $18 billion in cash. 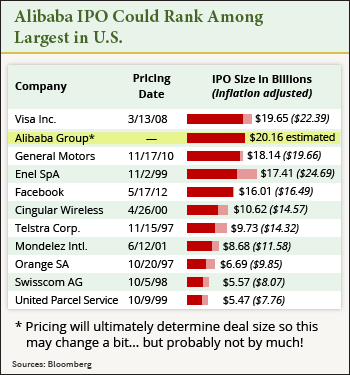 But Yahoo isn't the only one who will be hitting it big thanks to the Alibaba IPO. Here's who else is in line for a major payday. When companies hold initial public offerings, they hire big banks to perform the underwriting services on the deal. The underwriters help the company determine the IPO price, file the necessary paperwork, choose the right exchange, and issue shares, among other tasks. These underwriters collect a fee for their services, which is proportional to the size of the IPO. According to the Financial Times, the underwriters of the Alibaba IPO will be entitled to $400 million in fees, if the IPO raises the $20 billion many expect. JPM), Deutsche Bank AG (NYSE: DB), Goldman Sachs Group Inc. (NYSE: GS), and Citigroup Inc. (NYSE: C), leaving each bank with more than $66 million in fees.